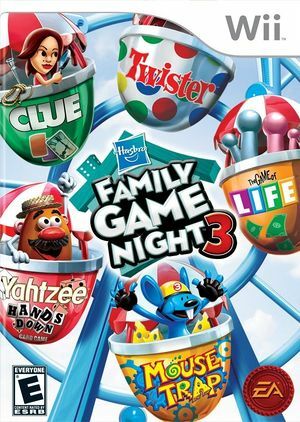 Discover endless family fun at the Hasbro Family Game Night 3 Theme Park! Spin the wheel of fate in the GAME OF LIFE, find out "whodunit" in CLUE, get your groove on with TWISTER, trigger crazy chain reactions in MOUSE TRAP, or try your hand at YAHTZEE HANDS DOWN. Enjoy classic and remixed versions of your favorite games, play with your own customized avatar, and challenge family and friends in online multiplayer! The graph below charts the compatibility with Hasbro Family Game Night 3 since Dolphin's 2.0 release, listing revisions only where a compatibility change occurred. This page was last edited on 18 January 2018, at 00:42.